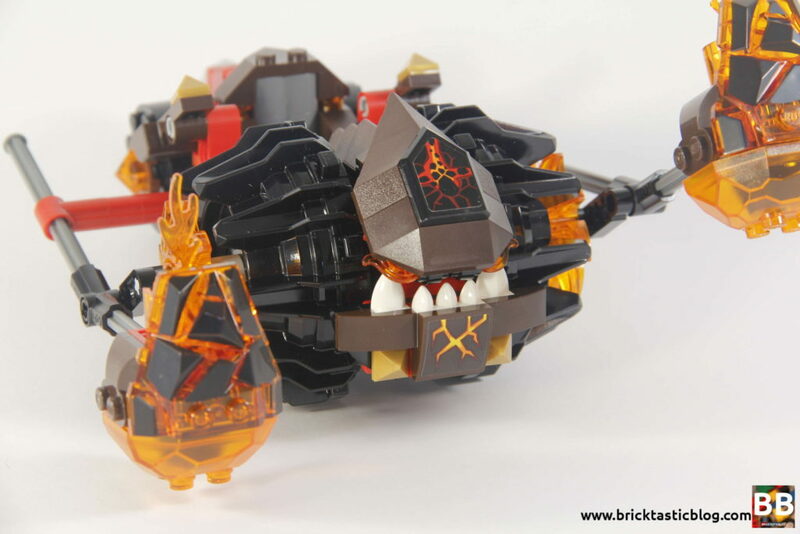 Nexo Knights is one of those themes that can be a little polarising. 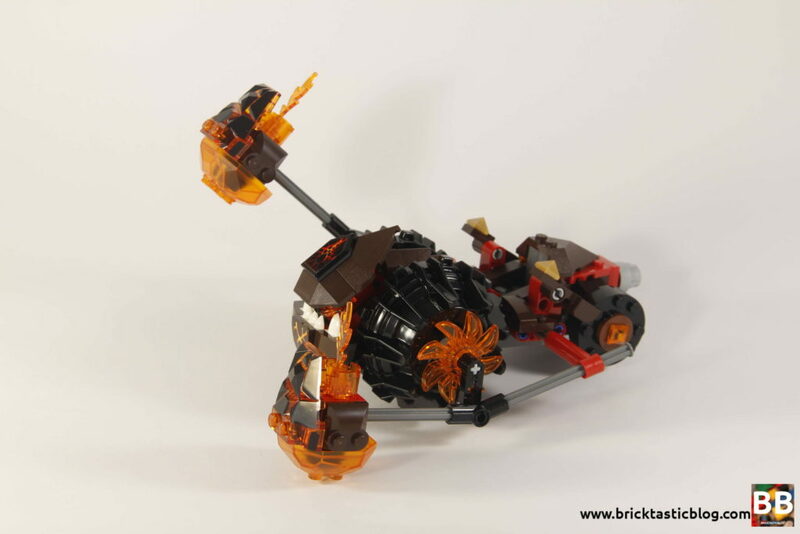 With bright orange parts taking a big part of the theme, and a mash-up of Castle and high-tech, the Nexo Knights theme has taken a huge chunk of TLG’s time and effort in promotion and other media. 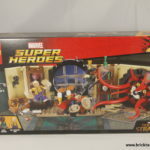 Not only is there the range of sets available, but there is also a TV series on Cartoon Network, a huge back story, and a companion app that works with the xisting shield elements that come with each of the sets. If you haven’t come across the Nexo Knights theme before, it’s a unique theme based around the adventures of five knights in the kingdom of Knighton (seems like an appropriate name). They defend their home against the evil jester, Jestro and his army, as well as the Book of Monsters. Our intrepid knights are led by Clay Moorington, and include Lance Richmond, Macy Halbert, Aaron Fox and Axl. I love how the names have come about – all being puns on weaponry of some sort. Axe (Axl), arrow (Aaron – a bit loose), lance (guess who this one refers to), mace (Macy), and my personal favourite, claymore (Clay). Apparently a claymore is also medieval sword, and not the mine. There is so much more to the back story, but let’s take a look at the set, before we get lost. Inside the box will be three parts bags, a sticker sheet with two stickers, an instruction booklet, and two large loose black wheel rims from the Power Miners theme. First, the minifigures. There’s two – Moltor and Aaron Fox. 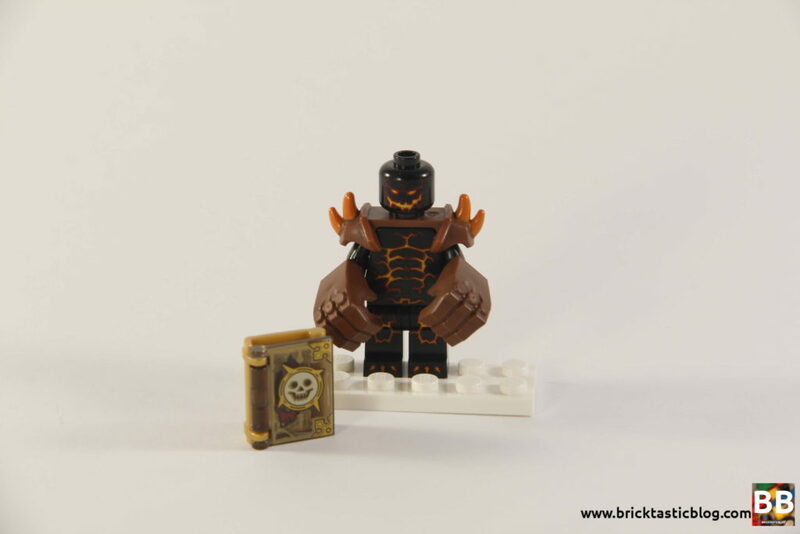 This is the only set that has Moltor included, so the head and torso are very hard to come by. The legs have been seen in another set, for another character. I really like the molten lava effect detailing. He’s suitably evil. Not only that, but he’s rocking some serious shoulder pad action, as well as some oversized hands / novelty gloves. Aaron is more armour and weaponry than person at the moment. His torso and legs have been seen before – with a very high level of detail including some chromed sections. His armour is pretty incredible. I’m surprised he can move! With the shoulder armour, helmet, crossbow/boltcaster thing and oversized shield, he must be heavy. Apparently the shield is a hovershield, but I’m not sure how he stays on it. Either way, he looks excellent, and comes with a reversible head. Determined on one side, massive grin on the other. One of the reasons I bought this set was because of the elements. There are heaps of interesting inclusions. The three elements that make up the Book of Monsters are intriguing. There’s a printed 1×2 tile, the transparent front cover, and the warm gold back cover. These books aren’t new. They were first seen in a few 2016 Elves sets, and I have to say, they’re really pretty! It’s a huge improvement. There is a large number of angled elements in dark brown, and an equal amount of transparent bright orange – rock uppers, saw blades, 4×4 roof rock elements, and more. The nicest element for me though has to be the 1×1 pyramid tile. 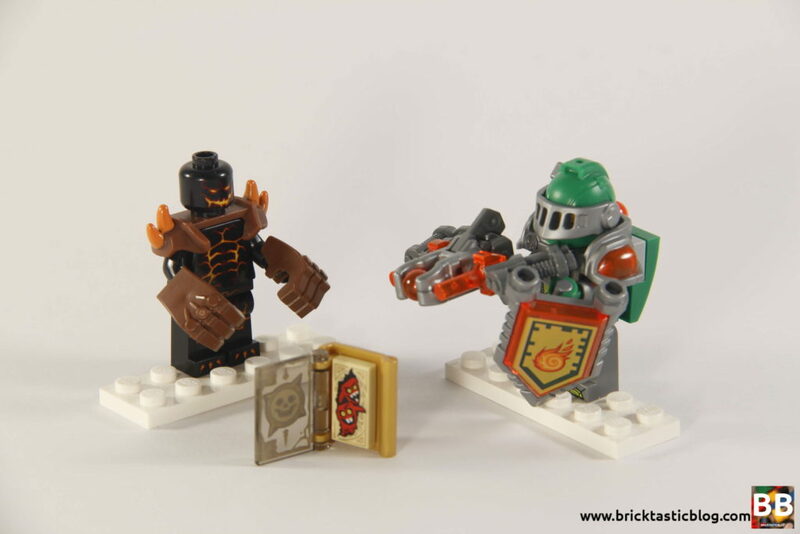 There are two colours – trans orange, and warm gold, and they are exclusive to the Nexo Knights theme. I think these will come in handy for greebling and other such details. There is only one play feature with this set, and it occurs when the vehicle is moved. Push it, and the molten “fists” move up and down in a smashing motion. They don’t connect with the ground, but it’s still excellent. There are also two catapults at the back of the vehicle that launch rocks. Like I said, it’s simple but will be fun for the kids. The build comes together very quickly, even with the moveable sections. It all starts with the core of the machine, and works along the centre. The axles are added, along with the rear wheels. All build action starts at the back and works it’s way forward. While the back is rather un-interesting, the front of the vehicle is much more detailed. I particularly like the scale-esque section running across the monster’s centre (much like the hackles of a cat). The front face is constructed, starting with the jaw, followed by the top half. I’m not sure if this beast has eyes, because I can’t find them! It might be the flames coming from what looks like it’s nose. The big Power Miners wheels are added, followed by the bashing arms. These are constructed with a very simple structure, but it looks excellent, especially with all that trans orange. The movement is a basic piston function. It’s quick, has some SNOT, and a couple of stickers at the front. 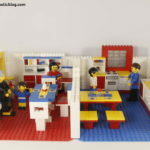 This set is something that a younger kid would have no problem with constructing. While the set looks unique, it’s still missing something. To me, the back looks slightly unfinished. I think it needs more bulk behind it to make it look more imposing, but the detail is at the front, where it needs to be. The minifigures look excellent. I reckon kids would have a lot of fun with this set. The amount of trans orange looks great, and definitely molten. This was one of those sets that I bought purely for the parts. 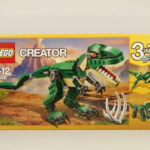 Being a retired set now, the price is a little different, but even during the time that it was on the market, this was often one of those sets that was regularly on sale. I was able to pay less than $30 for a copy, and then had to pay full price a month later (after forgetting that I already had a copy at home). Nowadays, for a new sealed box, you can expect to have to fork out around AUD$25. That’s a pretty good deal considering some of the parts included. There are also cheaper options around, so have a look around before you settle on one particular deal. 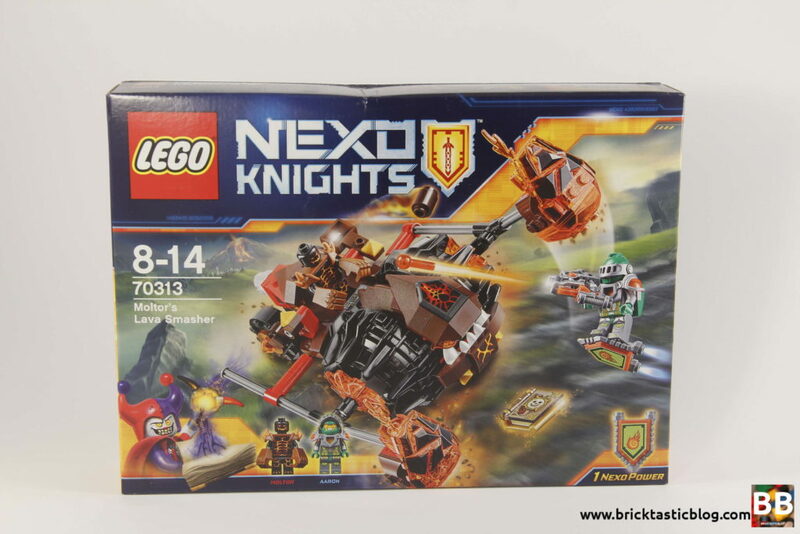 If you’re a Nexo Knights fan, you’ll want a copy of this one to complete the collection. Without it, you’ll be missing out on Moltor, and some pretty cool parts. If you’re not phased about completing the collection, then it’s an easy miss. Not too bad for my first Nexo Knights set. I’ve got a couple more to look at in the future. Next week, I’ll be reviewing 40166: LEGOLAND Train. On a side note, I’ve updated the Reviews page to be a fully searchable table, so now it’s easier to find what you want. 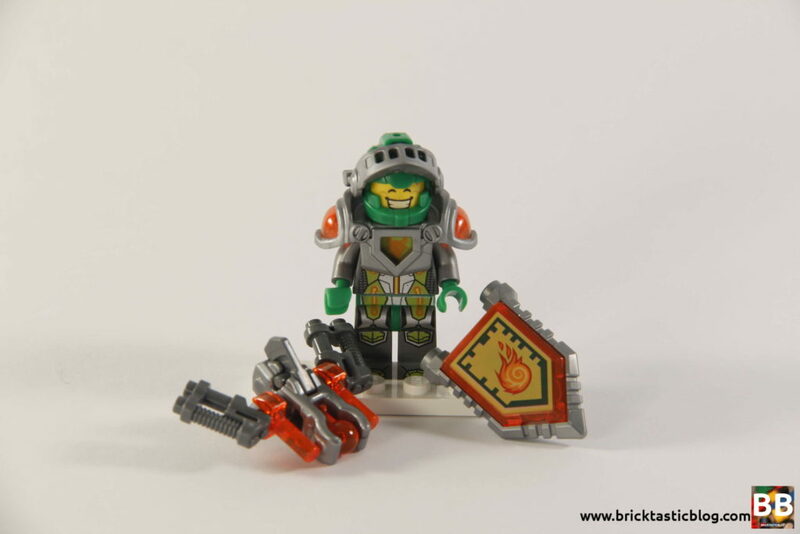 Are you a Nexo Knights fan? 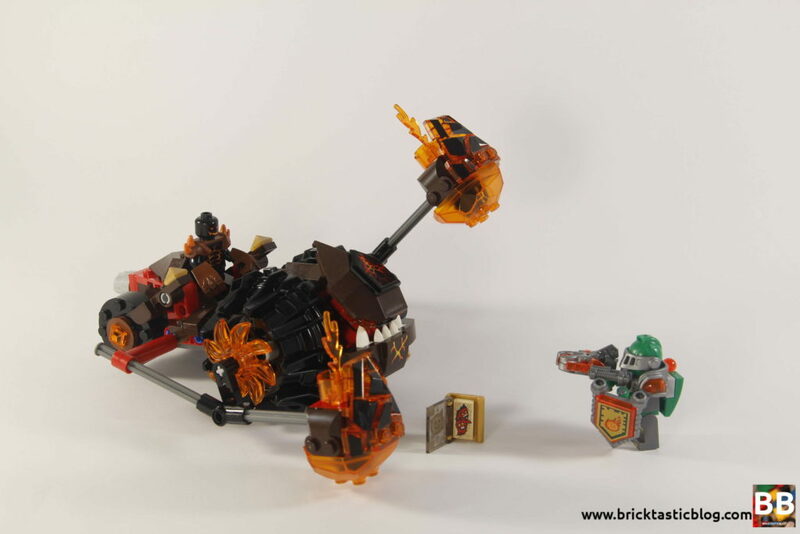 What do you think of Moltor’s Lava Smasher? Let me know in the comments below. I have to admit I was a anti NEXO when it was first released. However, with a NEXO Knights obsessed son it has slowly grown on me. 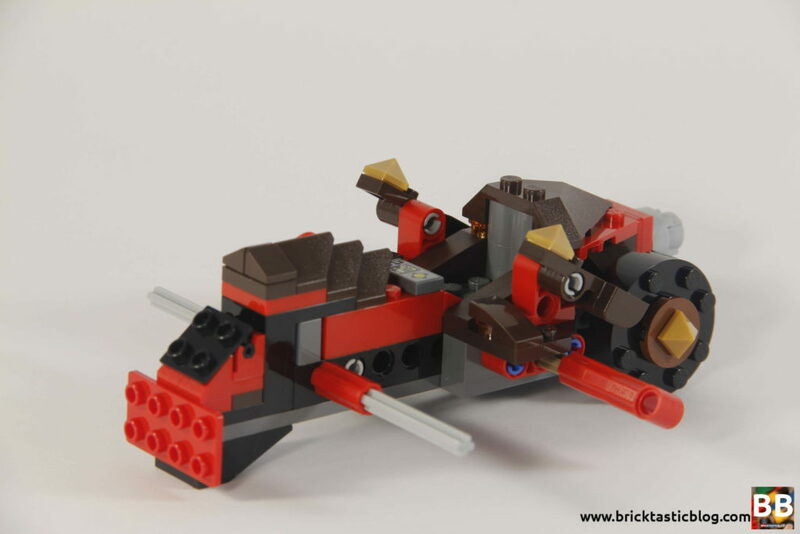 I may never personally collect every set, but if my son moves on to a new theme I have a great source of unusual parts for future MOC projects! On a side note – also loving the new colour scheme in 2017. Oh definitely. The purple and blue look brilliant. There are certainly a few sets included that aren’t at the top of my list, but the ones I do have look great. I’m pretty excited to grow the collection.